When I first approached my sister Diane about running a half marathon a year and a half ago, I got every excuse in the book not to do it from her. With every cop-out she unleashed, I shot back with a retort. What? You can’t run a half marathon because you don’t think you can do it? How do you know if you don’t try? What? You’re too fat to run a half marathon? 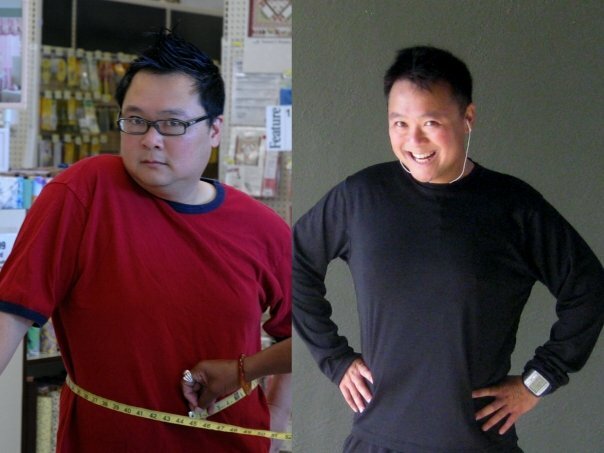 Maybe this will be a good way for you to get active and lose the weight that you’re always complaining about. What? You don’t have the time? You can’t make the time to improve your health? What? You can’t do it? Is it that you can’t, or you won’t? Oh yeah, I fired off all these things at her, and what finally got her to run her first was a little bit of coercion. 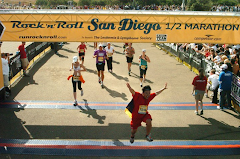 For her birthday, I registered her for the San Jose Rock 'N' Roll Half Marathon. I told her that she had plenty of time to train for that race, and if she decided not to do it, then she owed me 100 bucks! Well, Diane did train and she did cross that finish line! Something sparked inside of her after completing 13.1 miles and she vowed she was going to train harder to beat her time. Sure enough, a few months later, she ran the Oakland Half Marathon and improved her time by a whopping 14 minutes! 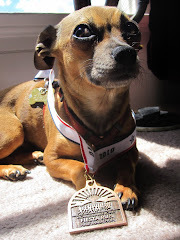 The running bug stung her hard and she signed up for a few more races. 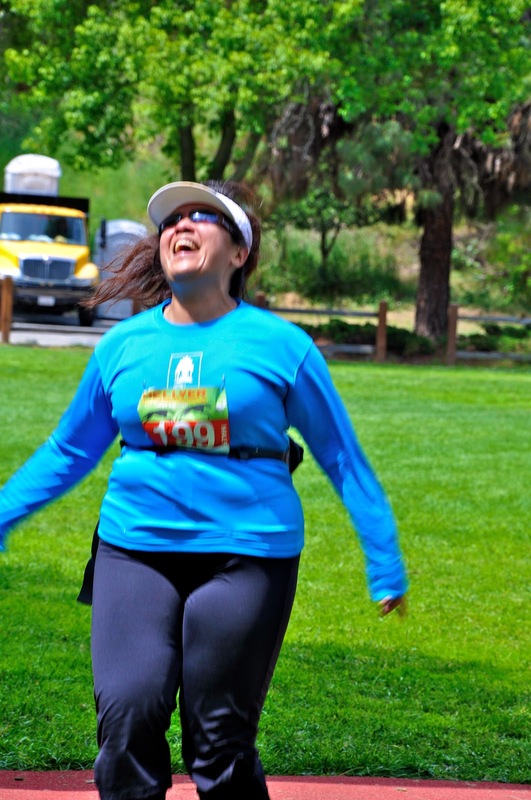 On April 16th, just a few weeks after running Oakland, Diane ran Brazen Racing's Western Pacific Half Marathon and shaved another 5 minutes off her time. Momentum hit an all time high for her as she continued to train for her third half marathon in three months. Today, my sister crossed the finish line at the Hellyer Half Marathon and scored yet another PR. Right before she hit that final timing mat, I pointed to the clock and made sure that she checked out her time. This moment was captured on film by the Brazen photographers. 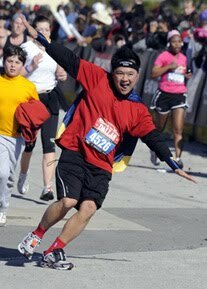 If you ever wondered what the definition of "endorphins" is, just look at this photo. And yes, it's another another PR! Now get this, not only did Diane PR for the fourth time and earned her first sub 3:30 half marathon finish, but this race qualified her for Half Fanatics. Yup, my sister Diane, the girl who complained about being fat and would never be able to walk around the block let alone finish a 13.1 miles, is now a Half Fanatic. Endorphin Dude's sister entered the Half Fanatic Insane Asylum in the most spectacular fashion possible. I guess making grand entrances and attracting attention runs in this family. It was very important for me to be at the finish line when Diane crossed, so I dropped to the 10k. 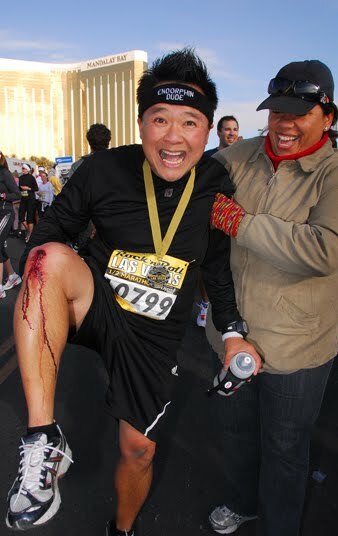 With my nagging injury, I just didn't think that I could cross the finish line before her. 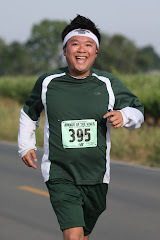 With the 10k, though, I was able to walk/jog it. Oh yeah, there were a few photo shoots that happened along the course as well. That little girl beat me. Yes, a 6 year old girl smoked me! One of my favorite peeps on the course, fellow Marathon Maniac Eileen. 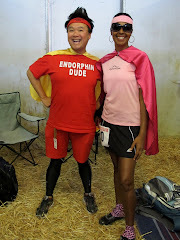 Me and fellow Marathon Maniac, Diane Adele. 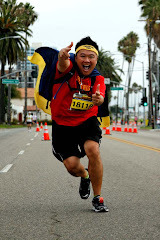 Here's another running super star, Ernie! 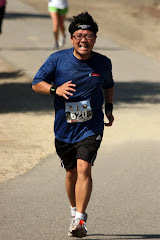 This Endorphin Dudette pounded out a PR at Hellyer! I swear, that guy in the middle is always pouting about something. I've talked about runner's high a lot, but for the first time ever, I experienced this thing called second hand runner's high. Seeing my sister Diane cross that finish line with yet another PR and then marching right in to the Half Fanatic Insane Asylum sent me into an endorphin high. 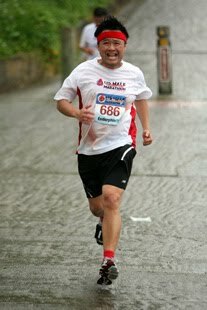 I may have only completed a 10k today, but the runner's high in my system felt like I just ran an ultra. This is a great post! I love that you were able to drag your sister into this wacky world. And I swear I'm not ALWAYS pouting. Being surround by so much bling with none to call my own just makes me sad (although I had a major blast working that 10K turnaround aid station).